Web forms are handy ways for organizations to capture insights about users, but research shows there are science-backed principles about web form construction and how to create them for maximum effectiveness. In the nonprofit sector, web forms are also useful for donation collection purposes. 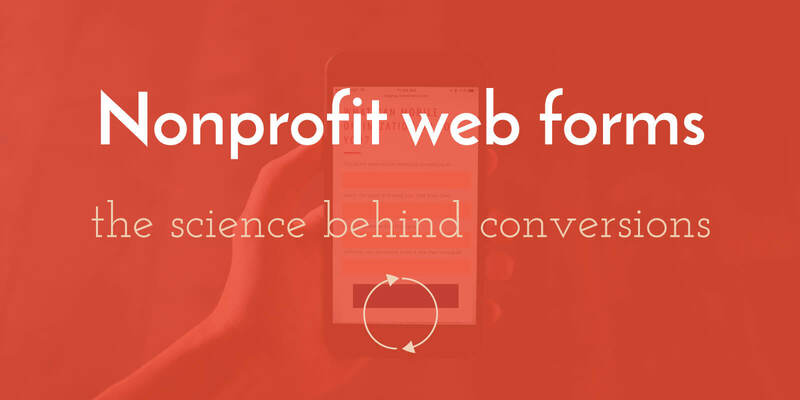 Below, we’ll examine some of the scientific findings associated with web forms and why it’s so important for your nonprofit to understand them. A 2015 study from Formstack polled more than 650,000 people across various industries to determine submission habits. The results found there are certain times of day when people are more likely to submit information than others, which differ depending on the forms’ purpose. A contact form got the most traction around 12:30 p.m. on a Monday, while forms about donations received the highest amount of attention about 2:30 p.m. in the middle of the week (Formstack). What that means for you is it’s important to coordinate and prepare any supplementary promotional efforts so people read and digest them before these times. For example, let’s say your nonprofit helps victims who have recently lost their homes due to severe weather events. If you have a blog post highlighting the impact recent hurricanes have had on the state where you’re headquartered, publishing it might be most useful on a Monday morning, based on the above research. By doing so, people can take time to absorb the information and submit a request for more details shortly after that. Provided that need is met, an individual might feel he or she is in a well-informed position to donate a couple of days later. Your nonprofit organization may not feel it’s worthwhile to hire seasoned professionals to design your web forms, but if your forms don’t follow basic usability rules, people are more likely to get frustrated. For example, visually focused form fields (such as those that highlight where people are in the process) and progress bars (that indicate steps remaining until completion) set expectations—particularly on a multi-page form. Longer forms that span many pages are more prone to errors, so it’s smart to rely on periodically auto-saving or using cookie-based data in the background in case something goes wrong. This practice improves your chances that users will complete the form, even after making a mistake. To emphasize the importance of expertise, a European study indicates that by applying 20 web usability-based guidelines while building a form, people can increase the chances of respondents filling them out successfully during the first attempt and cut down on chances of abandonment. You may have read research emphasizing the various schools of thought about form length. There’s a delicate balance between forms that are long enough to provide value to your nonprofit without making people feel fed up. Older research indicated shorter forms would increase conversions, but then more recent data conflicted with the previous findings. There are now arguments for forms with either one to three or eight to ten fields. In the first instance, there is very little room for mistakes, and it’s not likely people will give up before reaching the end. However, with a longer form, you have more opportunities to create context and incite desire. In the end, there is not a black and white answer when it comes to short versus long forms. Think about the context in which your form is being used—a quick volunteer signup versus a larger donation—and go from there. If a longer form is more fitting, when users have to scroll to complete the form, your nonprofit could insert snippets in the form’s sidebar to highlight things your organization has done to work toward your mission in meaningful ways. That kind of content suggests that by giving their details, people are getting involved in something that could make a difference. There are various case studies that prove you need to be mindful of things like the color of your call to action, making it look like a clickable button and even placing it strategically within the form. When attempting to boost conversions and get people interested in email marketing, Constant Contact paid attention to the details by making a CTA button that was a different color from its surroundings, had a clearly defined shape and border and even included a hand-drawn arrow and phrase drawing attention to it. Following similar procedures to ensure people don’t get confused before pressing “Submit” is crucial for your nonprofit’s forms. The lack of a completed submission makes a form useless for both you and the visitors who fill it out. The details you’ve just read should highlight how your nonprofit must understand these scientific principles behind worthwhile forms and confidently apply them when either making a form from scratch or editing it. Forms are often the first points of contact people have with your organization, and if they’re poorly built, people quickly and unconsciously begin forming opinions that are likely unfavorable and may be hard to change.